I for one am not ready to roll out the Christmas decor yet. I may be starting my Christmas cards but I am also thinking about Thanksgiving first. This project was for that time after Halloween and before Christmas. Several weeks ago I saved some beautiful fall leaves. I decided to use them in this project. 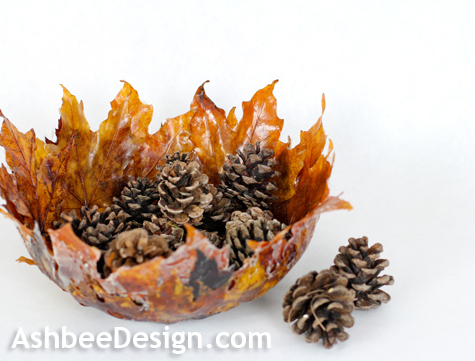 Using ModPodge and the leaves, I crafted this bowl. It was a quick and easy project (although there are several long soak and dry periods) and requires very little skill, just supplies. I especially like the ragged rim created by the leaves. That combined with the beautiful colors makes a stunning natural bowl for display - not for holding anything wet. I have seen this type of project completed with store bought fake leaves and fabric stiffener. I generally find the artificial leaves just too fake so I wanted to attempt this with the real thing. I selected leaves that were well shaped. I didn't worry about the size but if I do this again I would definitely use only small leaves. The larger ones pucker more with the compound curve of the bowl. I researched different methods of preserving them and decided to try the glycerine method. This method keeps the leaves supple but they do lose a lot of their color. Mix 1 part glycerine with 2 parts water. Submerge the leaves in the mixture in a flat pan and weight them down. Keep the leaves submerged for a week. 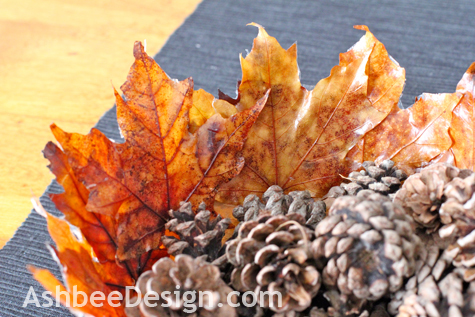 Remove the leaves and dry them on paper towels - Takes several days. Choose a bowl that has an interior shape that you like. Coat the interior of the bowl with vaseline. This helps stick the saran wrap in place. 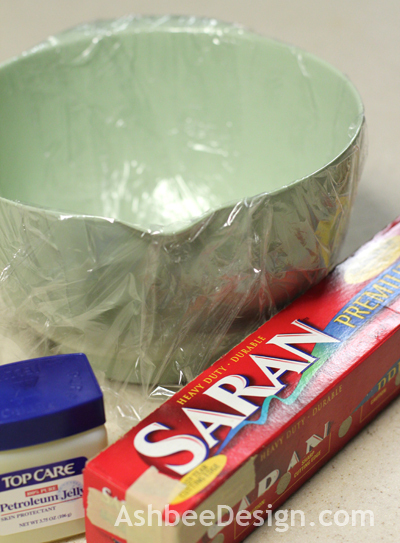 Cut pieces of Saran wrap about 3" wide and lay them over the edge of the bowl and down into the center. The goal is to completely cover the bowl insides but creating as few air pockets or big wrinkles as possible. Try to smooth it all in place. 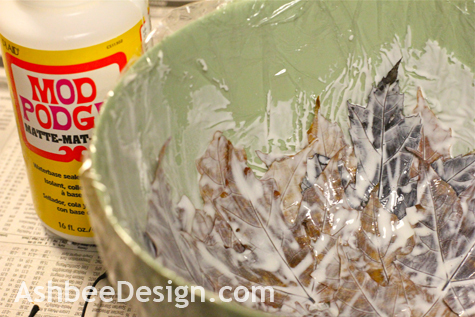 Small wrinkles are OK.
Brush a coat of Mod Podge on the inside of the bowl. Cut the stem off the leaves. It adds nothing and is difficult to deal with. 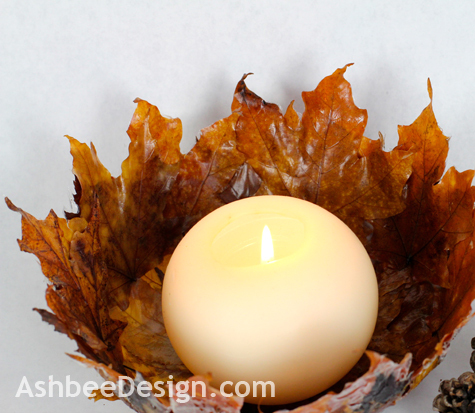 Starting at the rim of your finsihed leaf bowl add a leaf and cover it with Mod Podge working out the air bubbles. This is where you will find it is much easier to use smaller leaves. I thought I wanted a low bowl so started half way down the sides. I went back and added another row later which was problematic. I wish I had started higher. - Next time! Completely cover the interior of the bowl. Make sure you don't leave any spaces. 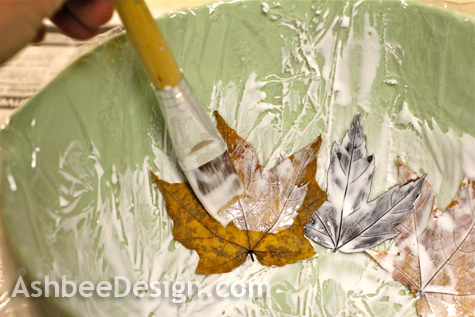 Also be sure to apply ModPodge on both sides of every leaf. Allow to dry. The inside which is exposed to the air dries in about 24 hours. I waited two days and then carefully took the leaf bowl off the bowl used as the mold. The leaf bowl was still flexible and still quite wet on the outer side. I placed it over a smaller bowl balanced on a tall container so it could continue to dry with out sticking to the counter surface and still maintain its shape. Here you can see the gaps that formed in the places I used leaves that were too large. I didn't have this issue with smaller leaves. Allow the bowl to continue drying. 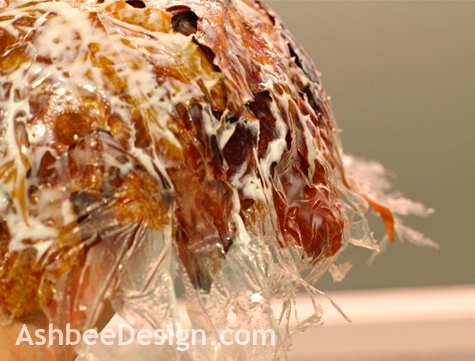 Once dry take a small pair of scissors and trim the excess plastic off the edges. This is why I wish I had made it taller. I think the candle light would glow through the leaves creating a beautiful centerpiece. I will need to try that for my Thanksgiving centerpiece. I hope I have saved enough leaves! More to come I hope! Very creative! Love those gorgeous fall colours. I did stop over and visit your blog, The Colours of India - beautiful. I can see why you liked the colors in the bowl, so similar. Thanks for visiting and commenting. very cool - I am going to try that. How is the laundry room coming along? Progress on the laundry room! Finish electrical happened this week. I need to squeeze in a trip to IKEA to get some more sliding panels, and create a few decor items, then I will be ready for the big reveal! This looks really beautiful! 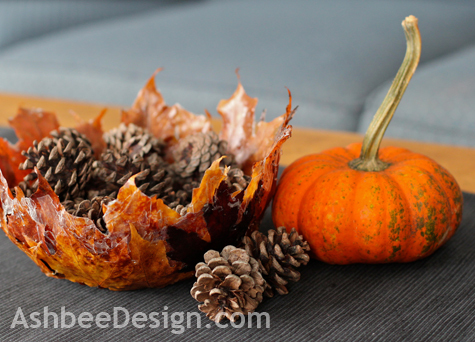 What a simple fall project idea. It was simple, as long as you remember to collect some leaves when you find perfect ones. Some years it is hard to find the perfect ones, but this year we had many. Still experimenting with different methods to preserve them. Thanks for visiting and commenting. Wonderful idea! I love natural elements and this makes great use of them. Wow, this is so creative! Thanks for the tutorial! This is so beautiful. I would love to make one and since it is Autumn in Australia.... I was just wondering if the saran wrap was essential to the stability of the bowl? I've seen similar ideas (using other materials) where the bowls are made over a balloon. You pop the balloon and are left with your modge podged bowl. Do you think that would work in this case? Thanks for sharing your idea. The saran wrap allowed me to be sure it would separate from my bowl, so yes, when working on a form you want to save, the saran wrap is necessary. For a form like a balloon which you discard it may not be.